As of today, the number keyword or seller-based products that can be featured per Amazon or eBay capsule will be lowered to two. 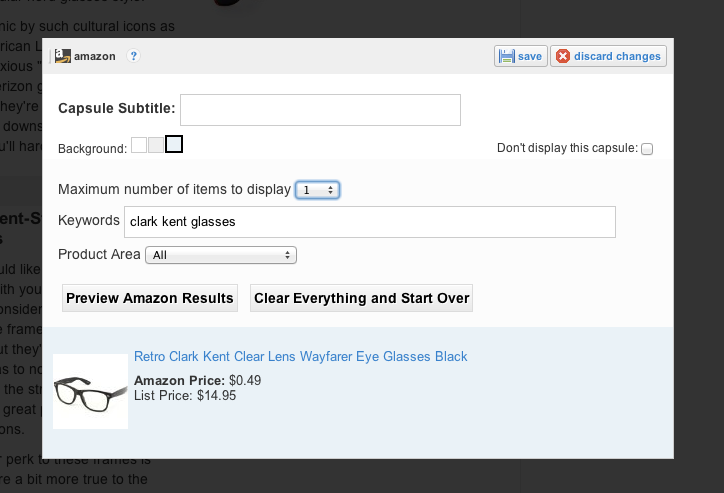 We have decided to reduce the upper limit to fight clutter in Hubs, help Hubbers present their pages’ visitors with a better experience, and (hopefully) boost Hubbers’ Amazon and eBay earnings. Capsules featuring more than two keyword or seller-based products will not be affected unless edited (when you edit a commerce capsule featuring more than two keyword or seller-based products, the limit gets brought down to two). The total number of manually-entered Amazon products one can feature in an Amazon Capsule (entered by ASIN or URL) remains capped at ten, however we do not necessarily recommend featuring ten items in the capsule just because you can. With many features on our site, we have found that when we present fewer options, we see an increase in the total number of clicks. By paring down the total number of keyword or seller-based items featured in commerce capsules, we hope that we might also help Hubbers drive more clicks and boost their earnings. Generally speaking, Amazon and eBay Capsules perform best when the products they feature are of very direct interest to the readers of a Hub. For example, an Amazon Capsule featuring a wind-proof umbrella in a Hub about different types of wind-proof umbrellas is going to perform much better than a Hub featuring a book about parenting in a Hub sharing general parenting advice. For this reason, we recommend featuring products sparingly and only featuring products when they are directly alluded to in the body of your Hub. I am still new to this site and haven’t got a clue about selling my articles to eBay or Amazon yet. Very good to know! Thanks! About six months ago when I was updating Hubs, I saw that some of my Amazon capsules had unrelated products – I even received a helpful notice from HP about one of them and an email from a friend about another – and some others had too many products and look really bad. It may be best to use specific products with every Amazon capsule from now on. I usually keep the number to 4 or less now. We encourage folks to input hand-picked products whenever possible, so I’m glad you’re making the transition, Patty Inglish! As you’ve found, keyword results are not always consistent/related. How long do we have to edit each hub and get the ads down to two in each category? Will they automatically cut back to just two? The limit will only kick in for your old Capsules if/when you edit them, so there’s no time limit. But you may want to consider limiting them when you get a chance since we’ve noticed better results with fewer products (and less visual clutter). Hope that helps! I think I´m following all of these tips for Amazon and ebay targeted Hubs. Just wondering, is there some statistics on the performance of good amazon and ebay targeted hubs?? Just wondering – are hand-picked products those that are found in the amazon or ebay site and entered with the product address and info? Thanks for all the good information! Yep, that’s right, vocalcoach! They’re specific products you select and enter the info for on the Amazon and eBay Capsules as opposed to selecting a keyword that automatically populates those Capsules with products you have not hand-chosen.